In the context of trading, "risk" refers to the probability of losing money or trading capital. Managing risk is the most important thing you do as a trader. That includes accurately assessing the risk involved in any given trading method or system and understanding how much you could potentially lose - both on a per-trade basis (defined by your stop loss) and over time (a metric known as maximum drawdown - the "worst case scenario" for a trading period). These numbers should be defined in your trading plan and should never be left to chance. Your trading plan must limit losses to an acceptable level if you ever hope to become profitable. Risk will always be there, and successful traders are constantly evaluating that risk, not by asking, "What can I win?" but instead by asking, "How much can I stand to lose?" It's important to acknowledge that you can lose all of the money in your trading account and even wind up owing more. As a result, you must have the financial means to support yourself during the learning process and to adequately fund your trading account. It is extremely important that the money used for trading capital is money that you can afford to lose. This means you should not use the kids' college funds, your emergency fund or the money you'll need for your mortgage payments. Although it may seem counterintuitive, trading is mostly about losing: learning from our losses, controlling our losses and accepting our losses as a part of trading. While it's easy to assume that profitable traders win a really high percentage of their trades (for example, many shady websites purport their trading systems win "close to 100% of the time"), the reality is that most winning systems win about 40% of the time. The key is to take more money on each winning trade than you give up on losing trades. This is what allows traders to make money over time. You can evaluate a trade's risk to reward ratio by comparing the expected returns of your trade (the profit target) with the amount of risk you undertake to capture these returns (your stop loss). The ratio is calculated by dividing the amount of risk by the expected reward. 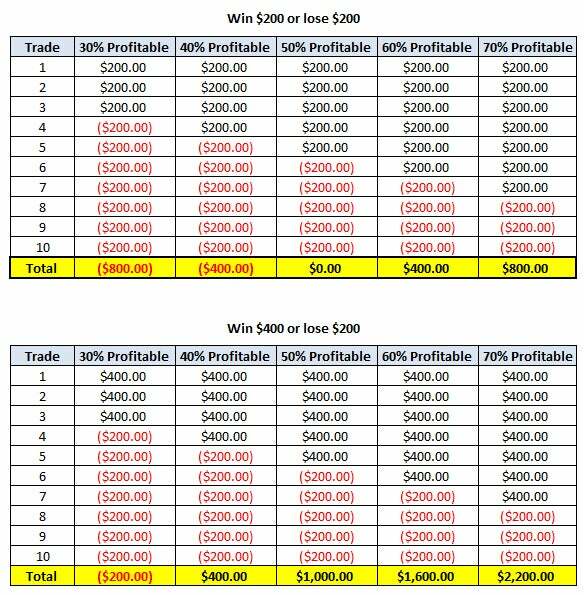 The following figure shows two scenarios: in the top chart, our trading system either wins $200 or loses $200 each trade. In this case, we have a 1:1 risk/reward ratio ($200 risk / $200 reward = 1). In the bottom chart, our system either wins $400 or loses $200 each trade. Here, we stand to gain twice as much as we stand to lose, so our risk/reward ratio is a more favorable 1:2. What's interesting to note is that our 1:1 strategy does not make money until we are 60% profitable; that is, until we win six out of the 10 trades. Using a 1:2 risk/reward ratio, however, we become profitable after winning only 40% of trades (four out of the 10 trades). This is a really important concept to understand in trading: a system isn't necessarily profitable just because it wins 80% of the time. What matters is the relationship between the average winning trade and the average losing trade. A system that is profitable only 40% of the time can make money as long as its wins are greater than its losses. The bottom line is when you are developing a trading plan or system, don't focus only on the percent profitable metric. This is only part of the picture. One of the most valuable measures of risk involves the concept of probability. In trading, we can never be absolutely sure which direction the market will move, so we have to rely on probability to help us understand the odds of making a correct decision. Probability can be expressed either as a decimal from 0.00 to 1.00, or as a percentage from 0 to 100%. A probability of 1.00 or 100% means something will always occur, while a probability of 0.00 means it will never happen. Keep in mind that when we analyze risk, we begin by looking at the probability of losing and not just the probability of winning. Before making a trade, we should know exactly how much we are willing to risk. Understanding risk allows us to make decisions that will help us develop safer and more profitable trading plans. By testing a trading plan on historical data we can view performance reports that tell us the expectancy of the system. The average trade net profit metric represents the expectancy of the system, or the average amount of money that was won or lost on each trade during the specified period. It is calculated by dividing the total net profit by the total number of trades. This metric shows the average profit the trader can expect on each trade to make over time. Use the right equipment - a fast computer, a fast and reliable internet connection, advanced analysis and trading platforms, etc. Use a protective stop loss - limiting your loss on each trade is an excellent way to preserve your trading capital. That said, it has to be balanced with giving the trade room to move. If you set your stop loss too tight, you'll have a hard time making a profit (conversely, if your stops are too loose, you'll also have a tough time making a profit). The only way to figure out the "best" stop levels for your trading plan is through testing and optimization. Stick to your plan - your plan has a mathematical expectancy: how much you can expect to make on each trade. If you skip trades, jump out early or stay in too long, you remove any expectancy from the system. Keep in mind, your methodology needs to be consistent in order to have any type of expectancy. Use margin and leverage prudently - take into consideration your potential losses instead of focusing on your potential gains. Use appropriate position sizing - sure, trading in big lots gives us the chance to make much more money, but we can lose a lot more money that way too. If you have a new trading plan in the market, give it time to prove itself - under a variety of conditions - before increasing your position size. Treat trading like a business - have a strategic plan for both the business and your actual trading. Your trading plan needs to specify what you will trade and how you will trade it. It should be thoroughly researched, tested on historical data, tested in a live market and evaluated at regular intervals. Remember that getting good at trading takes time - You wouldn't expect to pick up a football and be signed with an NFL team the next day. It's the same with trading. Even though you don't need an advanced degree, you still have to put in your time. Learn to add structure to your trading methods with these six important steps. If you want to trade futures to become rich, you'll have to answer some questions first.